MITCH TRAPHAGEN PHOTOS Spring Connect ready for fishing. Vogel developed the original product nearly two years ago and only recently brought it to market. When people hear about a “startup” these days, the image that comes to mind is usually a group of young computer programmers creating a groundbreaking new app. The reality, however, is that since roughly 2000, an increasing percentage of new entrepreneurs are over the age of 50, and they are using their earned life experience to create successful new businesses. John Vogel is among them. The Gibsonton native is a longtime farmer and a lifelong fisherman. Late last year he created a start-up company: JV’s Spring Connect, which combined his inventive mind with his love of fishing. His patent-pending product carries all of the hallmarks of one bound for success; it is brilliant in combining sheer simplicity while fulfilling a functional need in ease of use and convenience. In essence, Vogel built a better mousetrap…except it is a “better trap” designed to help catch fish. Vogel is an energetic and gracious man who says what he means and means what he says. When asked how and why he decided to create a new product and bring it to market, his answer was immediate: “I’m a fisherman,” he said. He created the Spring Connect to make things easier. He leveraged his lifetime of fishing into a product that helps those who share his love of fishing. In a rocking boat or when the fish are biting, a little convenience can go a long ways. Vogel pulls back the barrel to demonstrate the ease of use. The spring keeps the barrel in place. His product has both a website and a Facebook page. And it’s not just for locals — Spring Connect will work on nearly anything, anywhere. His new business is also a family affair. His daughter Melanie Kallai is his operations manager. His son-in-law Peter Kallai makes up his IT department as programmer and webmaster. Vogel’s current product has a stated strength of 75 pounds. Within a few weeks, he expects to have a new version with a 125-pound strength ready for sale. He plans to make yet another with a rating of 250- to 300-pounds. And he doesn’t plan to stop there. “Within a year, I hope to have a smaller one for bass and mullet and so on,” he added. 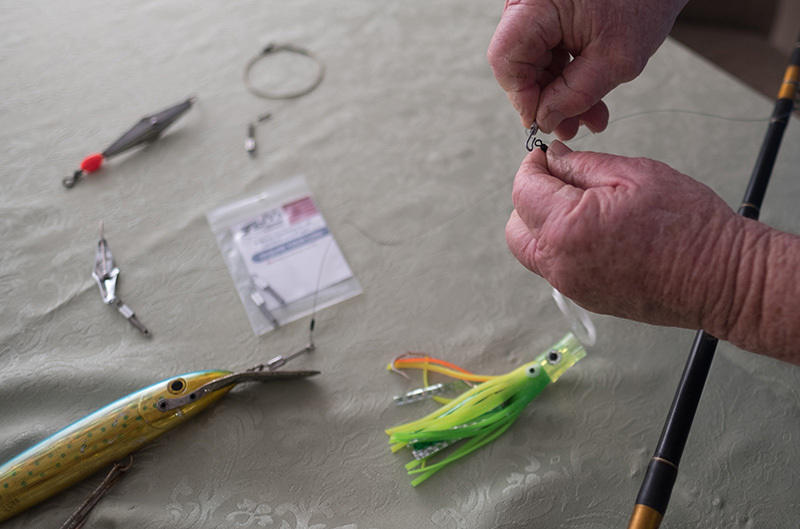 The product is ingenious in its simplicity: Before heading out for a day of fishing, simply tie a Spring Connect to your line and you can change your tackle in a second or two by sliding up a barrel and connecting it to the hook. A spring ensures the barrel stays in place, keeping your lure on the line. It also makes it easier on your skin to use the spring connect to tie off the line on your pole at the end of the day. 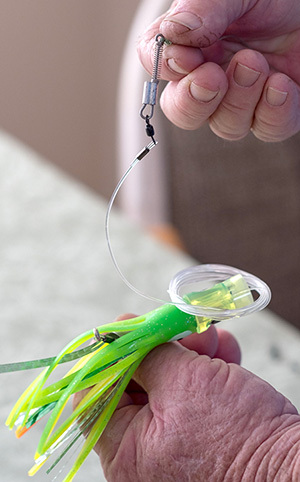 You don’t have to leave a sharp hook connected to your rod when transporting or cleaning it. Few people who have fished even occasionally have avoided getting caught by their own hook that way. Spring Connect lets you keep the sharp stuff in your tackle box and off your rod for storage. According to Vogel, despite its simplicity for those who love fishing, Spring Connect has three patents pending on it. He decided to avoid the use of a swivel because nearly everything already has one. Not having one keeps things simple and ensures the ease of use. Vogel’s knowledge of fishing is apparent to anyone within moments of speaking to him — he could seemingly describe every leader, every component, for every imaginable fish. And all work his new product. He’s not a boastful man, but he believes in his product. For Vogel, the sort of man for whom a handshake still means something, that speaks volumes. Startup entrepreneur John Vogel holding his new product, Spring Connect. The Gibsonton native leveraged his lifelong love of fishing into a patent-pending product. 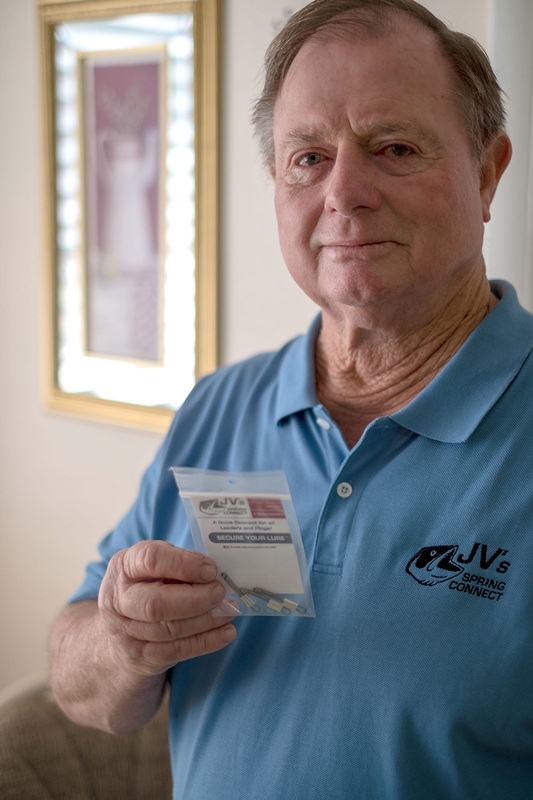 When many people would be looking towards retirement, John Vogel created a start-up. He did it his way, leveraging a lifetime of knowledge and, perhaps more importantly, ingenuity and integrity. He created a quality product that is designed solely to make something he loves easier to do. Spring Connect is available locally at T.A. Mahoney Company, Hooked Up Bait and Tackle and Below the Waterline Fishing. You can also order on his website at www.jvspringconnect.com, which includes a video demonstration of the product by Vogel himself. More information is available on his Facebook page at www.facebook.com/jvspringconnect or by emailing info@jvspringconnect.com. And true to his word, he invites those with questions to call him at 813-363-3292.